Observation - DSCF5639 - UK and Ireland. Description: We were looking into pond life in our garden pond. We found these tube shaped white/translucent creatures in the water. 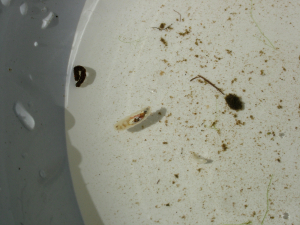 they were about 10mm to 15mm long and rolled around in the water. We thought they could be some type of larvae. Could be in pupal form? We were looking into pond life in our garden pond. We found these tube shaped white/translucent creatures in the water. they were about 10mm to 15mm long and rolled around in the water. We thought they could be some type of larvae. Could be in pupal form?